This is probably not R.Kellys R35 GT-R. It does have a rather large wing. 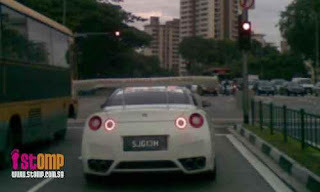 Spotted in Sinapore, posted on GTR UK Forums. More wing in the right place for a race car. Not so much a street car. This is seriously pathetic. That's not even functional anymore. To tell you the truth, its probably more functional than most wings you see on cars. You want the wing, high up in undisturbed air. It does need to be balanced though with a big splitter.